Island Beach State Park offers sunbathers pristine surroundings for their summertime enjoyment. But there’s more to explore at Island Beach State Park. Join IBSP Natural Educators and discover this unique barrier island ecosystem! Pre-registration required for all Guided Programs. 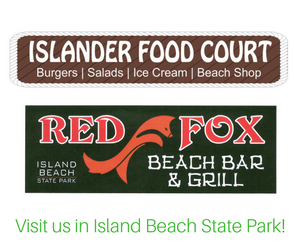 The Friends of Island Beach State Park is happy to once again be a part of the summer programs and activities at Island Beach State Park. We are a non-profit, all volunteer organization whose mission is to enhance the interpretive, educational, recreational and research programs and events at IBSP, and to encourage protection of the barrier island ecosystem. 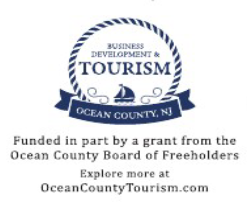 Conserve Wildlife Foundation’s partnership with Island Beach State Park enhances visitors experiences and connects more people to the outdoors. Conserve Wildlife Foundation is a non-­profit organization dedicated to protecting New Jersey’s endangered and threatened wildlife through research, education, conservation, management, and citizen engagement. Programs Explore the “wild side” of Island Beach State Park! Pre-­register for these fun, interactive and educational programs led by our team of Park Natural Educators.All proceeds support IBSP’s Interpretive Program! Sign-up for fun, interactive, and educational programs designed just for kids. Our expert team of Park Natural Educators are ready to take you on a wild adventure! Pre-registration required for all WILDCHILD Programs. See descriptions for age restrictions, times, and fees. Age-appropriate hands-on activities, stories, crafts and hikes guide your child’s natural curiosity as we explore the animals and plants of Island Beach State Park. Natural Educators provide an educational hour of fun for you and your young child. Bring sunscreen, drinking water, bug spray. Ages 3-5 yrs. with caregiver. Cost: $5 per child. Wednesdays: July 2, 9, 16, 23, 30, Aug 6, 13, 20, 27. (10:30-11:30am). Meet at the Nature Center. If you like exploring the outdoors, learning about animals, and investigating the ecosystem, then you’re an Island Explorer! Join us for 2 hours of catching fish, spying on birds, or learning about turtles, and more. A different topic is explored each week. Drop off your child for two hours of fun! Bring sunscreen, drinking water, bug spray. Ages 6 to 12 yrs. Cost: $10 per child. Alternating Fridays and Saturdays: July 5, 11, 19, 25, August 2, 16, 22, 30. (10am-12pm). Meet at the Nature Center. Surf’s Up Dude! What are waves? How are waves made? Where do waves come from? Paddle out Surf’s Up Dude! Learn about waves, what they are, where they come from, and why the waves break. Paddle out with expert Natural Educators and IBSP Lifeguards, and maybe you’ll be hangin’ 10 by the end of the summer! Bring sunscreen, towel, drinking water, wear bathing suit. Ages 8 to 17 yrs. Cost: $25 per child. Meet at the Park Office. (Times based on low tide) July 1 (10am-12pm), July 3 (10am-12pm), July 8 (10am-12pm), July 10 (4-6pm), July 15 (9-11am), July 17 (10am-12pm), Jul 24 (4-6pm), Jul 29 (9-11am), Jul 31 (9-11am), Aug 5 (12-2pm), Aug 7 (2-4pm), Aug 12 (9-11am), Aug 14 (9-11am), Aug 21 (2-4pm), Aug 26 (9-11am), Aug 28 (9-11am). Join Park Naturalists and Professional Culinary Instructor Joe Jakositz to learn how to harvest, clean, prepare, and cook your local catch. We will provide you with the necessary tools/tips to handle your culinary development. We will supply all of the food necessary to have a delicious meal. After learning how to prepare and cook, participants will get to enjoy a private dinner. Please be aware that shellfish and finfish will be on the menu. Cost: $25 per person. Friday, July 18 (5:30-8pm). Saturday, August 2 (5:30-8pm). Meet at the Ocean Bathing Pavilion 1. Enjoy kayak tours of the Barnegat Bay and Sedge Island Marine Conservation Zone. All equipment, including tandem kayaks, paddles, and personal floatation devices are provided. Ages 14 yrs. and older. Cost: $25 per person. For all kayak programs meet at the A-21 Kayak Launch. Expert Park Natural Educators will guide you on a peaceful paddle through the dynamic Barnegat Bay estuarine ecosystem. Discover the diversity of birds that inhabit Island Beach State Park in the summer. We will discuss migration patterns and birds that reside year round. Bring sunscreen, drinking water, and bug spray. (Binoculars suggested for best viewing of birds). Thursdays: July 3, August 7. (9am-12pm). Barnegat Bay was once a commercial hub for market gunners, baymen, and salt hay farmers. Learn about the people who lived here long ago and how they utilized the natural resources of the bay. Today, the Sedge Islands is a Marine Conservation Zone. Come join Park Natural Educators to learn more in depth about this unique ecosystem. Bring sunscreen, drinking water, and bug spray. (Binoculars are optional). Sundays and Wednesdays: June 29, July 2, 6, 9, 13, 16, 20, 23, 27, 30, August 3, 6, 10, 13, 17, 20, 24, 27, 31. (9am-12pm). Join Park Natural Educators for a peaceful evening paddle through the Sedge Islands, while watching the sunset over Barnegat Bay. Dusk is peak time for viewing wildlife including herons, egrets and foxes! Bring sunscreen, drinking water, and bug spray. (Binoculars are optional). Saturdays: June 28, July 12, 26, August 23. (4-7pm). Let’s get lost in nature! Park Natural Educators will provide an aquatic ecological experience for those interested in learning more about one of the largest estuaries in New Jersey. Learn all about the many functions of the bay, including the marine life, plants, birds, and geology of the area. Bring sunscreen, drinking water, and bug spray. (Binoculars are optional). Thursdays: July 10, 17, 24, 31, August 14, 21, 28. (9am-12pm). Join Park Natural Educators for an exciting snorkel adventure in the Barnegat Bay! Learn about an overview of the estuary, followed by diving into the shallow waters to explore both plant and marine life through total aquatic immersion. We will identify fish, crabs and other aquatic organisms. Bring sunscreen, drinking water, and bug spray. Mondays: June 30, July 7, 14, 21, 28, August 4, 11, 18, 25. (9am-12pm). Join us on an adventurous night hike to discover “whoooooo” is awake when the sun goes down at Island Beach State Park. When we arrive at the beach enjoy a bonfire, roast marshmallows, and listen to stories. Bring a flashlight, blanket or chair, sunscreen, drinking water, and bug spray. Cost: $5 per person. Saturdays July 12, August 30 (7-10 pm). Meet at the Interpretive Center. Bring your curiosity and keen senses as you join Park Natural Educators on a hike to learn all about the history and ecology Island Beach State Park. A variety of different topics of the park will be explored, including its diverse history, wildlife, and habitats. Bring sunscreen, drinking water, and bug spray. (Binoculars are optional). Cost: $5 per person. (10-11am). Wednesday, July 2. Meet at the Interpretive Center. Saturday, July 5. Meet at the Interpretive Center. Sunday, July 13. Meet at the Reed’s Road Trail. Saturday, August 2. Meet at the Interpretive Center. Saturday, August 23. Meet at the Interpretive Center. No fish tales told here! Come learn the basic techniques for successful surf fishing. All fishing equipment and bait provided. Bring sunscreen, drinking water, bug spray, snack/lunch. Minors must be accompanied by a pre-registered adult. Minimum age: 10 yrs. Cost: $10 per person. Fridays: July 4, 11, 18, 25, Aug. 1, 15, 22, 29. (9am-2pm). Meet at the Interpretive Center. Come listen to local professionals talk about trade secrets. Topics will include ethical photography, the methodology behind capturing images (lighting angles, camera selection, etc. ), a review of some of the professional photographers work, with an open dialogue throughout the program. Prints will be available to purchase at each event, with a contribution made to the Interpretive Program with each purchase. Minimum age: 10 yrs. Cost: $5 per person. Wednesdays (1-2:30pm). Meet at the Interpretive Center. Join Park Natural Educators and have some fun as you explore the natural wonders of Island Beach State Park! Children must be accompanied by an adult. IBSP Daily Programs are free with paid admission to the Park. Pull a seine net through the Barnegat Bay and discover the amazing creatures who live in the bay. Sheepshead Minnows, Pipe Fish, Blue Claw Crabs – what’s today’s catch of the day? Free daily programs at 11am and 1pm. Pre-register at the Fish Tanks in the Pavilion at Bathing Beach No. 1. Meet the creatures of the Park’s barrier island ecosystem. Discover who lives in our unique estuarine and coastal habitats. Be tickled by a mud snail, count the legs on a spider crab, see a pufferfish puff, and examine a sea star. Free daily shows at 2pm at the fish tanks in the Pavilion at Bathing Beach No. 1. Come join park naturalists as we watch, “The Blue Planet: Seas of Life” at the Interpretive Center. Natural Educators will briefly discuss how important coastal ecosystems are to the environment including Barnegat Bay before playing the movie. Guests are asked to bring pillow/blanket. Popcorn and water will be provided. All ages welcome, minors must be accompanied by an adult. Cost: $5 per person. Saturdays June 21, July 19, September 6 (6-8pm). Meet at the Interpretive Center.